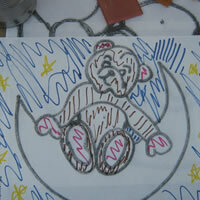 Print-out with the teddy on the moon picture, or any other picture you prefer. 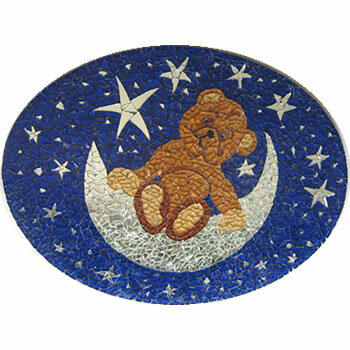 Print the teddy on the moon picture, or any other picture you prefer.  Your printer will allow you to enlarge or reduce the picture to fit the size board you have. You can scan and print the pictures from colouring-in books. Pictures or designs can be plain and easy to use. Don't think that the picture has to be complicated to make your mosaic stunning - the mosaic tiles and the way you put them together is what makes it stunning! You might have to puzzle your prints together and stick them together with masking tape if they are too big for a single A4 print out. 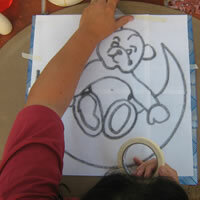 Tape enough sheets of carbon paper together to trace your teddy mosaic picture onto the board size you have chosen. Place your carbon paper on the board, face down. Then place your picture onto the carbon paper and use masking tape to stick the two bits down so they do not move around while you are tracing the design. Using a pencil, trace the design onto the board. Make sure you trace around all the bits so you can be sure you do not leave anything out. 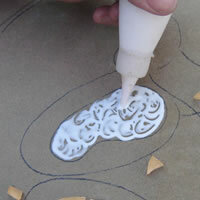 Print out a smaller design the same as the large one, and use Koki pens or coloured pencils to colour it in. 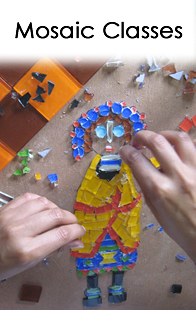 We do this so that when we're doing our mosaic we have a clear defined idea of what we want and can see which colour each piece of tile or glass needs to be. Sometimes it can get quite confusing when you are working and there are all sorts of coloured bits lying around! Take your picture off the board and make sure the design has been properly transferred. 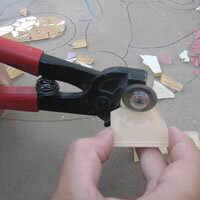 We are now going to squeeze some wood glue onto a small area. Don't glue a large area as the glue will start to dry before you have a chance to stick the tiles down. I have chosen to start on the feet. 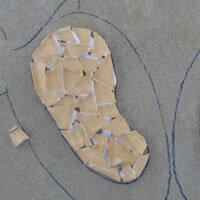 Start with the outline of the area you have glued. 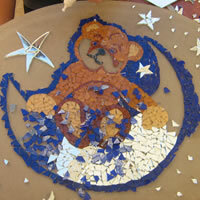 The important thing to remember when doing a mosaic picture is to stay in the lines. Even when we were kids at school, the thing that made colouring in pictures look stunning was how well we could stay in the lines. If you have jagged bits sticking out over the lines your picture will lose definition and clarity. 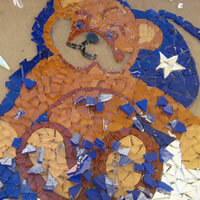 Also remember that the finer the detail, the smaller your mosaic bits will have to be. Once you have done the outline you can start filling in the bits on the inside of the design. 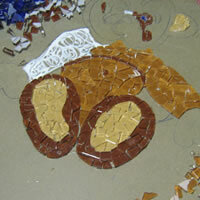 Remember, the smaller your bits of mosaic tiles are cut, the closer together you need to stick them. You cannot have areas that need to be grouted that are half the size of your bits or bigger. 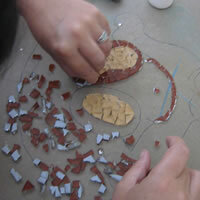 The spaces in between the mosaic pieces need to be a third of the size of the mosaic tiles or even smaller. We are going to continue in this manner for the rest of the picture and colour in bits and small sections at a time. When you have two parts that meet that are the same colour, you need to to define the lines by making either a darker or lighter line using a different coloured mosaic tile. The background and the picture will help you choose the best colour. 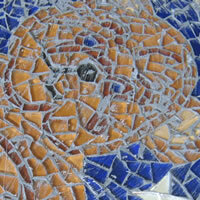 Two things that make a mosaic special are the choice of colour and the contrast used. 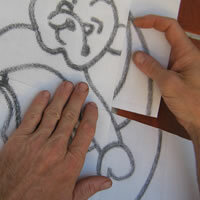 If you have a dark background then make a light teddy and use a dark colour as the defining lines. 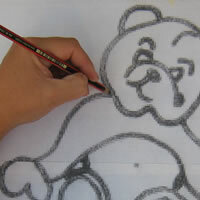 If your background is light, use a dark colour for your teddy bear and a light colour for the defining lines. This helps the design stand out when done. The other way to define lines is to leave a big gap between the two same colour parts. This will be filled with grout later on and the grout will divide the two parts and create contrast. Once we have completed the main picture on the board, we need to make stars for the background out of mirror. 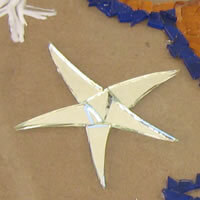 We are going to cut triangles out of mirror in a variety of sizes and create stars all around the teddy. We can also use small triangles in places to define the tiny stars. With our stars in place, we can now we can start filling in the blue background around the stars. 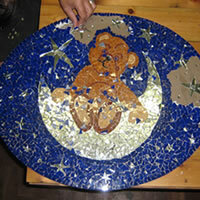 Keep going until all the parts are filled and are ready to be grouted. 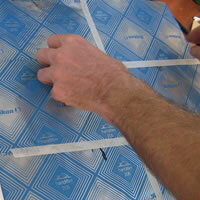 It is recommended to leave it overnight to make sure the glue has dried properly. Chose a colour grout that is neutral and won't conflict with any part of your design. I prefer using either white or grey for most of my mosaics, as the grout is used for bringing the whole picture together, rather than accenting any part of it. It is quite difficult to establish exactly how much grout you need for a particular project. The amount of grout you need depends on how big your board is, as well as the sizes of the spaces left in between each bit of mosaic tile stuck on the board. 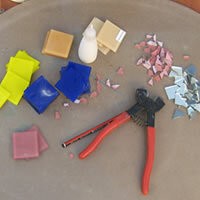 What I usually do is have a few smaller mosaic projects on hand to mosaic when I am done on the big one, that way I can use any leftover grout. This saves wasting and makes cleaning easy as there is no safe or good way of discarding of extra grout. TIP: Do NOT wash the excess grout down the drain when you are done, the grout will dry in the drain and cause a blockage. You need to use up as much of the grout as possible, then add water to any leftovers and throw it into the garden so it can mix into the sand. When you are ready to grout, place some grout in a bowl. Start by adding a little bit of water at a time and then mix it at each step. 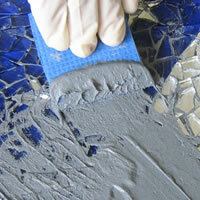 You have to be careful not to add too much water as the grout goes from very dry to very runny quite fast. Rather add a little bit at a time than end up with a solution that is too runny. If you add too much water, the best way to fix it is to add more grout, but only if you have the need for it as this could be quite wasteful. If you have added far too much water, you might need to consider starting again. We are trying to obtain a consistency like mayonnaise or a soft toothpaste. At this point I would recommend using a pair of gloves to protect your hands as the grout dries your skin very quickly. Using a grout applicator, old credit card or a bit of high density sponge, place the grout onto your picture and start spreading it out, making sure you work it into all the gaps and spaces. It is a little like spreading margarine or butter on a slice of toast! 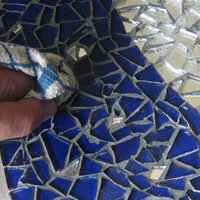 Leave the grouted mosaic to dry for at least 3 hours. 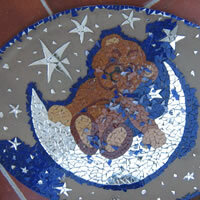 You can now wash the mosaic teddy on the moon with a wet cloth or sponge. Leave this to dry overnight and then wipe it down with a dry cloth to buff and shine the surface - your mosaic is now complete, HOORAY!